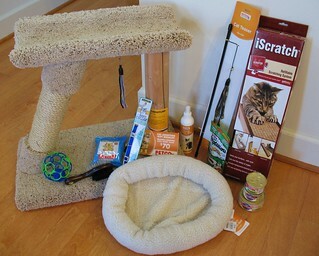 When it comes to purchasing the essentials for your new CH cat, many may seem rather obvious. 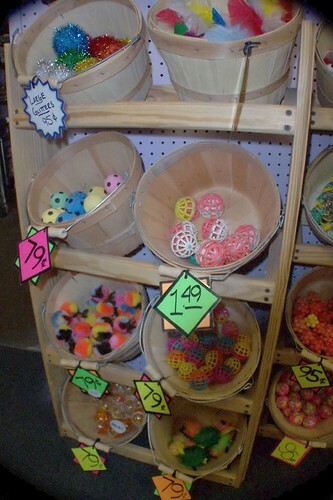 You can travel down the aisles of any pet store and practically pick up everything you need. Nevertheless, sometimes we go to the store for the obvious, and come home with everything but. Here’s a list of the essentials you should definitely have before your cat comes home, as well as some things that you can consider buying in the future. Food: The shelter will let you know about the cat’s eating habits: If they eat wet and/or dry, how much, and what brand. You may even receive a bag of food to take home with your cat. If you’re considering changing the type of food, wait a few days and first consult your veterinarian. Food and water dishes: You may want to carefully consider which dishes would be best for your CH cat, depending on how wobbly he is. You may also want to consider purchasing mats to place underneath the bowls. Cat bed: Line it with a thin blanket or towel for extra comfort. Medications: These are only necessary if they’ve been prescribed by a veterinarian. Toys: Your shelter may be able to clue you in to which types of toys are your cat’s favorite. You can also check out popular toys for CH cats as well as the best free toys. Carrier: You’ll want it to be large enough so your cat can get up and turn around in it. You may want to consider purchasing a hard-plastic carrier instead of a fabric one, as your wobbler may appreciate the sturdiness and support. Scratching post: You’ll want to train your cat to use this (and not the furniture!) from the moment he comes home. Consider one that’s stable, as your CH cat may pull it over. Depending on the cat’s age, especially if it’s a kitten, you may also want to consider hot water bottles, a smaller litter box, and a stuffed animal they can cuddle with. Is there anything else you think a new CH cat would need? Please share in the comments! ← Has The Severity Of Your Cat’s Cerebellar Hypoplasia Improved With Time? Foam floor tiles, can’t beat those for the CH babies! Is there any place to buy items such as a walker or feeding stand for the more sever CH kitties, or would these be homemade? One reader sent in this feeder that she’s been using: https://lifewithchcats.com/2012/02/02/try-this-feeding-stall-for-messy-eaters/, and I’ve seen a number of other similar feeders available online. As for walkers, this link may be able to help: https://lifewithchcats.com/2012/02/04/what-you-need-to-know-about-walkers-for-ch-cats/ it also links to a post about how to make your own walker. Good luck! One other thing I would add to this is that if you can get a running water fountain (such as Drinkwell), do it. I’ve found that it helps my CH cat to judge the depth of the water so he’s less apt to fall into the dish from not being able to see the water or judge the distance/depth. Also, I’ve heard that running water is better for all types of pets than just a dish of standing water. When I switched to this I noticed that all of my cats started to drink more water. The Breeze litter system works great for ours. It gives her something to lean against and the pellets don’t make as big of a mess as regular litter does. We have also put an old blanket on the cushions of our couch and it hangs down to the floor so she can climb up onto the couch.